LLOYD'S BEWARE THE BLOG: Walt Disney's "Davy Crockett, King of the Wild Frontier"
Walt Disney's "Davy Crockett, King of the Wild Frontier"
So starts the "Ballad of Davy Crockett" that caught every boy's imagination around my age of eight and a phenomena was created beyond even Walt Disney's imagination and vision. The mini-series starred Fess Parker as Davy and Buddy Ebsen as his friend George "Georgie" Russel. Who sang parts of the ballad throughout the three episodes shown in glorious black and white on the "Disneyland" television show. This is a look at Walt Disney's mythical version of the life of Davy Crockett as seen through my eight year old eyes. In 1954 a 15 inch RCA (Radio Corporation of America) color console television set cost $1000, While a 24 inch Magnavox black and white console television set was only $249. Also although there were scattered color broadcasts such as the "Rose Parade". The first coast to coast commercial television program in color, "Bonanza", did not premiere until five years after "Disneyland" on September 12, 1959. That program was on NBC (the National Broadcast Company). NBC's parent company, at the time, was RCA the major maker of color television sets. In 1961 Walt would move"Disneyland" to NBC as "The Wonderful World of Color". Resulting in a lot of those original black and white programs, such as all five episodes of the Davy Crockett mini-series, being rebroadcast as they had been shot, or produced in color. A 23 inch Admiral color console television set would soon be $349. Only a hundred dollars more than that 24 inch 1954 black and white Magnavox. American families now started the transition to color as did the other two networks CBS and ABC in earnest. Returning to June 16, 1954 Warner Brothers Pictures was about to release a science fiction film entitled "THEM!". Jack L. Warner was a friend of Walt Disney and knew Disney enjoyed Science Fiction movies. So he invited him to a private screening of his giant ant motion picture. Walt Disney had the projectionist stop the film, so the story goes, and rerun a scene several times. As that story further goes. Walt saw an actor named Fess Parker within that repeated scene. Walt next told Jack L. Warner he had found his "Davy Crockett" and wanted to know who the actor's agent was and the rest became television history. My reader who was not born in the late 1940's as I was, or the early 1950's needs to know the tone of the times. With "The Cold War" at its beginning American's were looking for heroes. In Walt Disney's mind who was a better hero, role model and example for young children than the Frontiersman, Congressman and fighter who died for Texas Independence at the Alamo? Disney knew exactly what he was doing in reinventing and further creating the mythic Crockett's Legend on those small 13 to 23 inch black and white television screens in America's living rooms. As I mentioned above Buddy Ebsen was cast as Davy Crockett's loyal friend George "Georgie" Russel, spelled with one "L" in the credits. He was originally to play Crockett, but seeing "THEM" changed everything for Walt Disney. Ebsen was a singer,dancer, actor and author. He had been cast as the "Tin Man" in 1939's "The Wizard of Oz", but had a very bad reaction to the make-up which contained aluminum and was replaced by Jack Haley. He would go on to appear on many television programs and eventually his own in both "The Beverly Hillbillies", 1962-1971, and "Barnaby Jones", 1973-1980. Six short months after finding his "Davy Crockett" on December 15, 1954 I saw the first of three installments on "Disneyland" entitled "Davy Crockett Indian Fighter". Like all episodes of "Disneyland" it was bookmarked by Walt explaining the program the television viewer was about to watch and at it's end he would come back to give the viewers a preview of the next show. "Disneyland" had a running time of one hour including commercial breaks and Disney's opening and closing. Leaving an approximate 40 to 43 minutes of average story content. The plot of "Davy Crockett Indian Fighter" takes place during the Creek Indian Wars. Crockett and Russel are volunteers to Major-General Andrew Jackson's army. Jackson needs scouts to find out the location of the Creek's and their Warrior Chief Red Stick. The volunteers are under the command of Major Norton and there is friction between them. When Davy announces that as the war against the Creek's will last through winter. The volunteers start to leave to get meat and supplies for there families. Norton blocks the bridge with a squad and a cannon threatening to shoot. As Crockett passes he asks if the Major wants him to bring something back. The viewer meets Davy's loving wife Polly and his two boys. As the story progresses Crockett and Russel go in search of Red Stick and "Georgie" is captured. This leads to a confrontation and tomahawk fight between Davy Crockett and Red Stick ending in the handshake above. As Davy gives his word to protect and honor the treaties made with the Native Americans. Playing the Creek Warrior Chief Red Stick was Pat Hogan. Hogan was born in Oklahoma and his parents belonged to the Potawatomi and Oneida Tribes. On January 26, 1955 the next installment in the mini-series "Davy Crockett Goes to Congress" premiered on "Disneyland". The viewership was up sharply from the first program and the merchandising impact was just beginning. I will speak to that shortly.. This adventure starts out with Davy and "Georgie" saying good-by to Polly and the children. The two then head out west to find new land to build their homes on. It is made clear that Crockett's present place is too small for him and he has a wanderlust. They arrive at a settlement after finding some beautiful land near a river to settle on. There they learn of a group of men who are stealing land from the Cherokee's. They ate led by the man Davy won a shooting match from Bigfoot Mason played by Mike Mazurki. While clearing the land to build a cabin Davy and "Georgie" find a scared Cherokee family hiding from them thinking they are with Mason. Davy decides to take on the job of magistrate and right the wrongs to the Indians. By winning a fist fight with Mason and taking him and his men into custody. Back at the settlement Davy gets a letter from Polly's sister telling him his wife has died of fever and she is taking care of his young sons. Time passes and Davy is talked into running for State Legislature. After a success in the legislature ex-Major Tobias Norton returns. He explains the ex-General Jackson is running for President of the United States and they want Crockett to run for Congress. Norton talks Congressman Crockett to tour the country as Jackson is on his last term and he might be a strong candidate to run for the Presidency. Not interested in running for that high office Davy does agree to visit other states. As he is being presented a rifle that he names "Betsy". "Georgie" shows up to inform Davy that this was all a trick to keep him away from Congress were a bill to take away the land given to the Indians is being debated. He returns to Congress and wins the day for the Indians he gave his word for. Davy Crockett's Congressional career is ruined and with "Georgie" Russel the two men leave Washington City. On February 23, 1955 the final installment of the original series premiered entitled "Davy Crockett at the Alamo"
To show the power this show was having on the American viewing public in 1955. The final installment had a viewership of over 40 million people. An unprecedented amount at the time. Davy and "Georgie" are on a River Boat still not sure were they're going. On the River Boat they meet a co-man; gambler played by Hans Conried named Thimbelrig. In 1953 the actor provided the voice of Captain Hook in Walt Disney's animated classic "Peter Pan". He also played the "evil" piano teacher of Tommy Rettig's dreams in Theodor Seuss Geisel's (aka" Dr. Seuss) written movie "The 5,000 Fingers of Dr. T". The three become friends and Thimbelrig joins Davy and "Georgie" after its decided to go to Texas to help in the fight for Independence. On their way they are joined by a Comanche nicknamed "Busted Luck" played by Nick Cravat. Cravat had been the circus partner of actor Burt Lancaster and appeared in films with him. The group of four men continue into Texas and are told that the Texan's are surrounded at an old mission called the Alamo. As they approach the Alamo the group is attacked by some of Santa Anna's troops. The four men race toward the mission and William Travis has the gates opened and they enter. Travis was played by Don Megowan. Who the following year would play the land version of "The Creature from the Black Lagoon" in "The Creature Walks Among Us". He would also return to join Fess Parker in Walt Disney's 1956 "The Great Locomotive Chase". Davy is taken to the injured Jim Bowie. At the time this series was being filmed the character of Bowie was played by my next door neighbor Kenneth Tobey. Tobey is known for three classic Science Fiction films: Howard Hawks' "The Thing from Another World" and Ray Harryhausen's two motion pictures "It Came from Beneath the Sea" and "The Beast from 20,000 Fathoms". He would also rejoin Fess Parker as "Jocko" in the two Davy Crockett episodes based around the Mike Fink Keel Boat Race story. The final installment of the original series basically shows the defense of the Alamo and ends with Davy Crockett swinging "Ole Bettsy" as the episode fades out and he becomes mythic legend. Fess Parker would go to star in Disney's "The Great Locomotive Chase", "Westward Ho, the Wagons", "Old Yeller" and "The Light in the Forest", Eventually he would return to that coonskin cap not as Davy Crockett, but "Daniel Boone". That television series would run from 1964 into 1970. Later in life Parker created a winery with over 1,500 acres of vines in Los Olivos, California and opened a "Double Tree-Hilton" Hotel at his property. Both are active today. 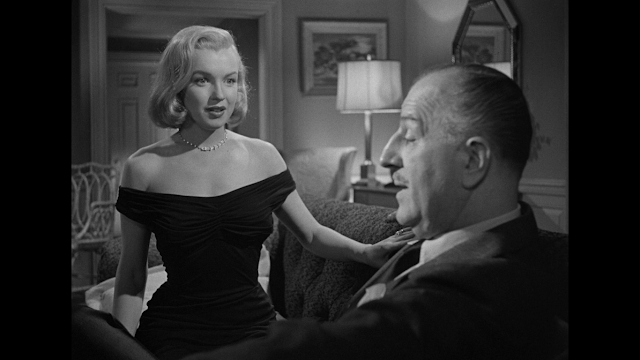 Note that the film was in widescreen. Although the aspect ratio for television was changed. Walt was always thinking ahead and had the picture shot in the larger format. The motion picture version runs 93 minutes. The three segments of the original televised series without Walt's introduction and closing run approximately 129 minutes. In short approximately 36 minutes of the original was cut for the feature length film. Disney had not planned to release the picture in the United States, but the response to the television series and the fact that he could push the feature as being in both "Color" and "Widescreen" made him change his mind. On May 25, 1955 the feature length version was released. We kids loved it and knew before from the previews that this was the television show, but in color. Of course we also were upset by the editing. In the United States, alone, the picture grossed $2,150,000. Remember that the average adult movie ticket in 1955 was only 49 cents. The gross for the film is remarkable and also illustrated the Davy Crockett craze Walt had created. Below is the French movie poster for "Davy Crockett, King of the Wild Frontier". Note that Fess Parker is advertised on it as "Fier" Parker. The word "Fier" in French means "Proud". The result of finding a way to bring his mythic legend back was to pit Davy Crockett and his loyal friend George "Georgie" Russel against another mythic legend Keelboat man Mike Fink, the "King of the River". The Keelboat race between "The King of the Wild Frontier" and "The King of the River" is full of fun and trickery on both sides. Mike wants Davy and "Georgie's" furs, but Mike makes the mistake of betting that if Davy and his crew of non-Keelboat men beat him. He'll eat his hat red feather on all. So the race to New Orleans was on. In the end Mike and Davy have become friends and this led to the second installment "Davy Crockett and the River Pirates" which premiered on December 14, 1955. Mike Fink and Davy Crockett team up to stop a group of River Pirates who are disguising themselves as Indians and attacking and killing people as their boats pass their hideout. Davy Crockett once again keeps his promise to the Indians. In this case Chief Black Eagle, that is shown in the above picture, to get the the men who are behind the attacks. Chief Black Eagle was played by actor George J. Lewis, Lewis is better known to Disney fans as playing Don Diego's father in the television series "Zorro". 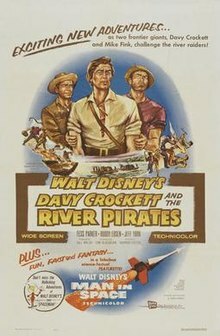 On July 18, 1956 the two episodes were edited together to become the feature length film "Davy Crockett and the River Pirates". 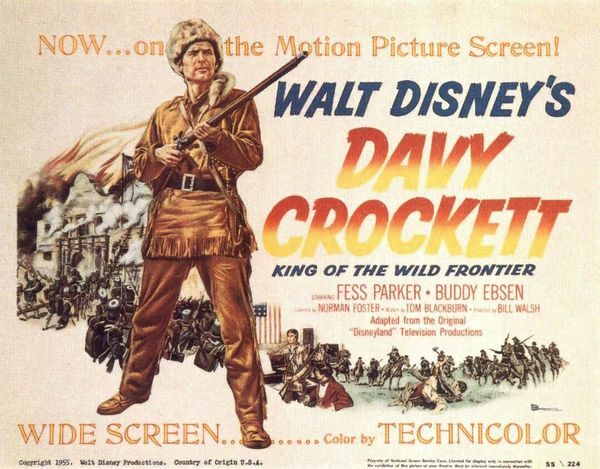 The year of 1955 was full of Walt Disney's Davy Crockett. You had two of the three episodes of the original mini-series. The release of the feature film version of that series and the two added Mike Fink programs. Not to forget that on July 17, 1955 Walt opened a little thing he called "Disneyland" in Anaheim, California. I would first visit the park for my birthday October 16th. There was a live televised broadcast on opening with guest hosts. One of them was an actor named Ronald Reagan, but more importantly in the grand opening day parade was Fess Parker decked out as Davy Crockett and Buddy Epsen as "Georgie" Russel. Here is a shot of the two actors rehearsing for the opening of "Frontierland". While all of this was happening a gold mine in merchandising sales beyond anyone's plans was taking place. I mentioned those 40 million viewers of the television show, but that was only a part of the story. I now turn to the merchandising aspect of the series and its affect on young boys like myself at the time. Since the hay days of radio there have been shows with merchandise attached to them. From early television I convinced by mother to buy "Ovaltine", which I hated, so I could get the inner seal, like other kids, and send 25 cents for a "Captain Midnight" decoder ring. I had a Fort Apache play set from "The Adventures of Rin-Tin-Tin" and my "Lone Ranger" cap pistols, but nothing compared to what the Disney Merchandising machine did to me and millions of others around the world. 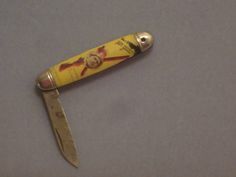 This is a very small sample of what came out in connection to Davy Crockett and still sells at all the Walt Disney's theme parks around the world. One of the first items to go up for sale were "Davy Crockett Coonskin Caps". Every boy wanted a cap and like me talked their parents into getting one. 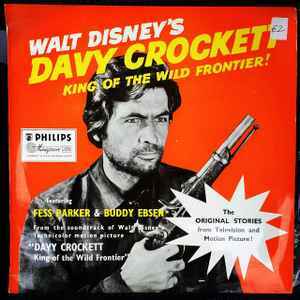 Then there was that song: "The Ballad of Davy Crockett" sung by many artists including Fess Parker, Bill Hayes and Tennessee Ernie Ford. All three of their versions made the "Billboard Charts" in 1955 with Hayes having a #1 hit. The song sold a total of ten million records that year. On the album pictured below, which I own on CD, you have Fess Parker's version of "The Ballad of Davy Crockett" plus his singing of other songs which were cut for the feature length "Davy Crockett, King of the Wild Frontier". Along with condensed versions of the three original mini-series adventures. Then there were other records released containing some of the songs other than "The Ballad of Davy Crockett". "Be Sure You're Right (Davy's Motto)" was song by Jimmy Dodd and the Frontier Men. Jimmy Dodd on October 3, 1955 would become one of the two Adults on the original "Mickeyt Mouse Club". I mentioned the condensed stories on the CD I have. At the time there were three two 78 RPM record sets released by Disney. Each contained the entire soundtrack from one of the mini-series episodes. Of course there were the Dell comic books and books from Walt Disney. Can't forget the lunch boxes and note some had the word "Official" making them much more prized. Of course there were miscellaneous items for sale and the following pictures doesn't come close to the Walt Disney authorized products. Memories of great to have. At this time I am 69 years of age and still look fondly on "Walt Disney's Davy Crockett, King of the Wild Frontier" As I am sure others of my generation do. It's hard to explain that feeling, or what Fess Parker's character meant to us children living at the start of the "Cold War". Where we had daily drop and cover drills in school and listened to air raid siren tests. It was a really scary time for America, but having hero's to look up too and make believe your where sure helped a lot.